eBay has blocked the auction of Bosch Fawstin’s cartoon that won the first annual Muhammad Art Exhibit and Contest organized by Pamela Geller and Robert Spencer for the American Freedom Defense Initiative. eBay Removed my winning Mohammad cartoon listing, citing a “technicality”. They’ve confirmed it’s Fishy, effectively blocked its re-listing. 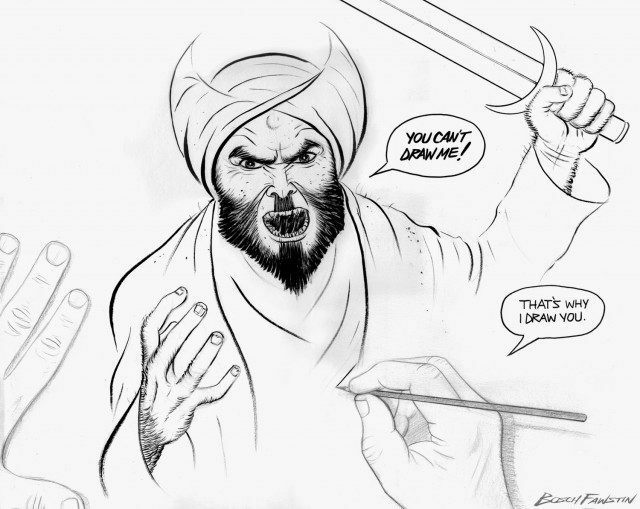 The art depicts an artist drawing Mohammed with the dialogue, “‘You can’t draw me.’ ‘That’s why I draw you.’” After Breitbart News did a story on the auction, the bidding jumped above $10,000. Fawstin’s picture won the first annual Muhammad Art Exhibit and Contest organized by Pamela Geller and Robert Spencer for the American Freedom Defense Initiative. The First Amendment-themed event was attacked by terrorists with AK-47s, although the terrorists were shot dead by an alert officer before they could attack the event. Before eBay removed my listing on a “technicality”, the current highest bid for it was $10,000 in only three days. To the bidders (I had 37 bids) and the 108 “watchers” on eBay who are interested in my Mohammad cartoon: eBay removed the listing on a “technicality”, and after an attempt to correct it and re-list, they erected a couple of new obstacles to doing so, effectively barring it from eBay. Contact me to be notified of my next step.